Generalized hypermobility is relatively common in patients presenting for clinical assistance. Symptoms may be limited to musculoskeletal structures, including joints, ligaments, entheses and muscles. Due to defective and lax connective tissue in the organs and related systems, a wider range of symptoms/signs can also occur, from autonomic dysfunction to aneurysm and arterial ruptures. Of those people who present for clinical assistance, a good portion are suggested to represent the upper end of a bell curve for the spectrum of normal joint mobility. While hypermobility decreases with increasing age, generally females are more hypermobile than males and there is greater prevalence in Asian populations compared with Caucasians. A smaller proportion of people with hypermobility can be classified with benign joint hypermobility syndrome (BJHS) or variants of Ehlers-Danlos syndrome (EDS). An estimated 10-30% of adults, 10-15% of boys aged 11-17 years and 20-40% of girls in the same age group are affected by BJHS. EDS, where hypermobility type is the most common, has an estimated prevalence of 1:5,000. Awareness and classification of hypermobility variations is considered important since some forms, such as BJHS, are often under-recognised and poorly managed. In addition, while rare, there are life-threatening complications in some syndromes due to the connective tissue fragility. Hypermobility is commonly diagnosed with the Beighton Score, while the multisystem aspects of hypermobility are taken into consideration by inclusion of the Beighton score into the Brighton Criteria – with its more comprehensive set of criteria. It is worth noting that some researchers consider there to be little meaningful difference between BJHS and EDS hypermobility type, as they are diagnosed clinically (with no useful laboratory tests) and their management is the same. Of the many potential musculoskeletal symptoms, a variety of different headaches are reported in some one third of EDS hypermobility type patients. A range of anomalies in cardiovascular, cervical spine, meningeal, TMJ and muscular structures are believed to be implicated, via various postulated mechanisms. In particular, ligamentous laxity in the cervical spine may cause headaches by C1-C3 dysfunction via the ‘myodural bridge’ between rectus capitis posterior minor and dura mater, along with C0-C2 hypermobility due to intermittent nerve root compression with certain neck movements, such as rotation and lateral flexion. Furthermore, of importance to practitioners of manual therapy, is the reported association between connective tissue hypermobility and cerebrovascular accidents. Thus, appreciation of the degree and extent of cervical joint instability should be included in the diagnostic workup of hypermobility patients. 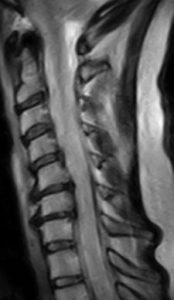 Ms P, a 53 year old florist was referred for a recumbent/upright cervical spine MRI by her neurologist in relation to suspected cervical spine instability due to previously diagnosed EDS hypermobility type. Symptoms consisted of retro-orbital pain, with increasing frequency over a six year period. Grossly normal craniocervical junction anatomy. No substantial vertebral body height loss. Loss of normal cervical lordosis when supine with a mild kyphotic curvature from C5 to C6. Cervical lordosis is maintained when upright, although with minor 2mm retrolisthesis of C2 on C3. Posterior disc osteophyte complexes from C4 to C7, most marked at C5/6, which increases by up to 1mm in AP dimension when sitting upright. As a result, there is mild to moderate spinal canal stenosis from C4 to C7, although without convincing evidence of cord compression. Change in intervertebral alignment between supine and upright positions would be consistent with the history of EDS. If we can be of assistance with cervical spine imaging, contact us on 03 9592 3319. As part of Brighton Radiology, an independent QIP Accredited Diagnostic Imaging Service, low dose CT, long view X-ray, multislice orthopaedic tomosynthesis (hybrid X-ray/CT) and general X-ray are also available. Castori M, et al. Connective tissue, Ehlers-Danlos Syndrome(s), and head and cervical pain. Am J Med Genet Part C 169C 2015: 84-96. Jacobs J, et al. Hypermobility syndromes from the clinician’s perspective: an overview. Acta Rheumol Port 2014:39;124-136. Cattalini M, et al. When flexibility is not necessarily a virtue: a review of hypermobility syndromes and chronic or recurrent musculoskeletal pain in children. Pediatric Rheumatology 2015:13(40);1-9. This is general health information designed for educational purposes only. It does not constitute individual health advice and should not replace thorough consultation with a registered health care practitioner. This entry was posted in Uncategorized on May 15, 2017 by admin.